According to MSHSAA’s Eligibility Standards, a student-athlete will be ineligible to participate for a school if they were “influenced by a person to attend that school for athletic or activities purposes.” However, that rule does not apply to middle school history and homeroom teachers. That is where Mt. Vernon’s Ashley Childers, a two-time All-State golfer for the Lady Mt’neers, was first “recruited” to the sport of golf, and her sixth grade homeroom teacher has been reaping the benefits the past four years. That would be Leah Clark, who has taught history at Mt. Vernon Middle School for 22 years. Clark is also the only coach that the Mt. Vernon girls golf program has ever known, and the architect of a mini-dynasty with the Lady Mt’neers having won 10 district titles in the program’s 15 year history. Clark got Childers set-up to take lessons from Leon Faucett, a longtime PGA golf pro and fixture in the Mt. Vernon golf community until his death in May 2012. Childers was hooked immediately, and became a regular at the Mt. Vernon Golf Course and driving range. Childers has since blossomed into one of the top golfers in the state. The senior led Mt. 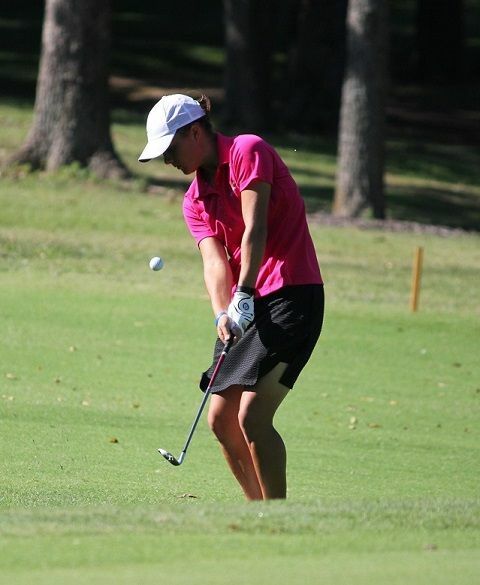 Vernon to a pair of 4th-place finishes at the MSHSAA Class 1 State Girls Golf Championships as a freshman and sophomore, which included earning All-State honors with a 10th-place finish in 2012. Last year, Childers finished as the state runner-up after firing a two-day 153 at Sedalia Country Club. Childers is also a champion on the Missouri Golf Association Junior Circuit. In fact, Childers has won back-to-back Missouri Junior Match Play Championships, and also won the 2014 Junior Amateur Championship by one stroke July 6-8 at Paradise Pointe Golf Complex in Smithville. Although Childers played in just two MGA Junior events this year, she still finished in 4th-place in the age 16-18 Player of the Year rankings, which are based on points awarded for various tournaments throughout the season. 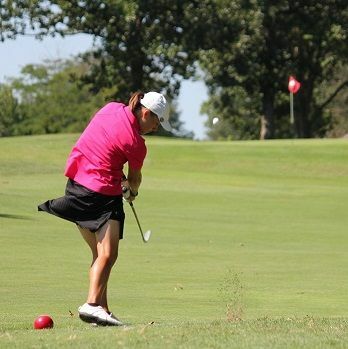 Childers also was one of just six girls to represent Missouri in the 2014 Southern States Cup Matches Aug. 4-6 at Dalhousie Golf Club in Cape Girardeau. The three-day tournament pitted the top junior golfers from Missouri, Arkansas, Mississippi and Oklahoma, and featured coed four-ball and foursome matches, as well as singles matches. Childers will be staying close to home next year after verbally committing to golf at Missouri State for head coach Kevin Kane. It is one less thing for Childers to worry about her senior year. “It’s a great program and a great coach,” she said. Jack Nicklaus has been credited with saying that, “Golf is 80% mental, 10% physical, and 10% luck.” Childers, who now takes a weekly lesson from Rivercut PGA pro Ron Sweet, has a strong mental approach to the game. Good luck finding out what song that is, though. “I can’t tell you…it’s a secret,” she said when pressed for details. So what makes Ashley Childers such a good golfer? Has she ever played a “perfect” round? “It’s my ability to hit it from anywhere,” said Childers, when asked what makes her so good. “I’ll get it back in play no matter where I hit it. I have this motto: ‘Anyone can play from the fairways, but it’s the skilled players that can play from everywhere else.’ No matter what, I am always going to try something to get it back in play. There are lots of sports to compete in, but Childers was drawn to golf due to the individual nature of the sport. Yes, she is part of a team, but individually, each and every round is a challenge to play her best. “It’s so individual,” said Childers of the sport. “Every day is an opportunity to play your best. Every shot, every round, every time you pick up a club.” For the record, Childers’ best day was an impressive two-under 70 to win the Bolivar Invitational last year on a windy day at Silo Ridge Country Club in Bolivar. As tenacious and dominating as Childers is on the course, she is equally humble off it, yet still intimidating in her demeanor. With the girls golf season cruising along, and with district tournaments scheduled across the state from Sept. 29 to Oct. 1, Childers’ senior season is fast coming to a close. There is one clear goal in mind for last year’s state runner-up. Childers is definitely not putting any carts before the horse by looking past districts and sectionals to State. Actually, she has already mentally prepared herself for both the district and sectional tournaments. The district tournament will be hosted by Purdy on Sept. 29 at Cassville Golf Club, while the sectional tournament will be played at Marshfield Country Club. The Lady Mt’neers will be looking to reach the podium again this season after failing to bring a plaque home to Lawrence County last year. With all the competitive golf she plays, one would think that Childers would love to just go out and play a friendly stress-free round. One would be gravely mistaken, though. What if Ashley Childers would have had a different home room teacher in sixth grade? Who knows, but with Leah Clark retiring from coaching after this season, colleges may want to give her a ring. After all, she has already proven that she is a good recruiter.